WASHINGTON, D.C.— On Friday, the Metropolitan Police Department (MPD) unlawfully detained and arrested 222 protesters, bystanders, journalists, and NLG Legal Observers while subjecting them to chemical weapons including tear gas and pepper spray. This violated § 5–331.07, which prohibits kettling and mass arrests and requires police to give dispersal warnings. Despite the media’s focus on isolated incidents of property destruction, MPD indiscriminately targeted people for arrest en masse based on location alone. In response, solo practitioner and NLG member Jeffrey Light brought a lawsuit against the MPD that same day. Police held arrestees at 12th and L St. NW for hours, denying basic needs such as treatment for injuries, water, and access to bathrooms. Police then pepper sprayed, tear gassed and subjected other protesters to concussion grenades without warning, including the elderly, people with disabilities, and children. Most were held overnight, and all were eventually charged with the felony of inciting a riot, despite a lack of individualized probable cause. In addition, phones and other belongings were confiscated by police as evidence, with many protesters only having their wallets returned. If convicted, the protesters face up to ten years of incarceration and a fine of $25,000. “If the violence inflicted by police—including chemical weapons deployment without warning in violation of DC law—represents a return to the violence protesters were subjected in decades past, MPD is clearly following the lead of the Trump administration’s far-right rhetoric and reverence of white supremacy. These illegal acts are clearly designed to chill the speech of protesters engaging in First Amendment activity,” said Maggie Ellinger-Locke, DC NLG Mass Defense Chair. Thousands of demonstrators filled the streets of the nation’s capital on January 20 to protest the Inauguration of Donald Trump, and in response, the National Lawyers Guild (NLG) trained and deployed hundreds of Legal Observers, ran a legal support hotline and partnered with jail support groups to arrange for jail visits and the legal defense of arrested protesters. 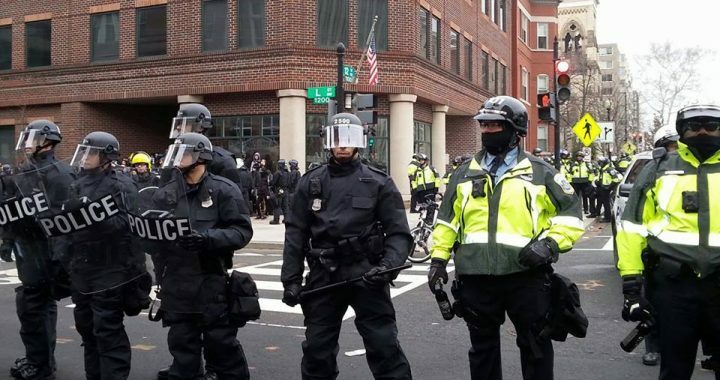 NLG Executive Vice President and DC NLG member Ria Thompson-Washington said: “In the face of successful lawsuits, city ordinances and MPD internal policies banning the practice for years, this anti-protester violence represents an unacceptable crackdown on dissent by DC metro police. The NLG will continue to protect the right to dissent and those who exercise it. Posted in Press Releases and tagged DC NLG, Donald Trump, First Amendment, Legal Observers, NSSEs, Police, Protest.